Split Apple Retreat is on the border of the oceanfront Abel tasman National Park, located at the top of the South Island an hour outside Nelson. The park is world-famous for beautiful walking tracks past a series of secluded golden beaches and along the top of towering granite cliffs. Renowned too for its mild year-round climate, it offers a host of activities, including hiking, kayaking, fishing, horseback riding, sky-diving, sailing, swimming with the seals and dolphin-spotting. A helicopter can be arranged to drop you at remote scenic spots and for private picnics at otherwise inaccessible beaches. We can organize your activities, with personal guides. Or perhaps you would like to enjoy the aesthetic and artistic bliss of a traditional Japanese tea ceremony and calligraphy session with a Japanese grand master calligrapher and tea ceremony adept (exclusive to the Split Apple Retreat). And, of course, on your return, be treated to more of our gourmet fare and unwind and recover with our Health and Wellness services and facilities. DISCOVER MORE. A day long boat trip into the Abel Tasman National Park with kayaking around Tonga Island's seal colony, a walk to a headland, wonderful lunch and drop off at a romantic golden-sanded beach, can be organized for you. If you're lucky, you may get to see blue penguins, dolphins, or even orcas.. Explore flora and fauna along the coastline with a knowledgeable naturalist. Learn about the uses and benefits of a variety of plants. There’s no better way to explore the beautiful top of the South Island than from a luxurious helicopter that departs and lands directly from the landing pad less than 5-minutes away! Split Apple Retreat is a perfect place for a honeymoon holiday. It’s Trip Advisor’s Travellers Choice for Romance. Unforgettable weddings can also be arranged. Just ask. Fly fishing for trout in the remote, pristine Karamea River, part of the beautiful Kahurangi National Park, or ocean fishing for snapper, blue cod and king fish, can be arranged. Bring your catch home so that Chef Pen can prepare it for lunch. Split Apple offers wide range of bespoke cycling experiences in the Nelson-Tasman area on high quality trail bikes designed for comfort and performance. These tours can be self-guided, guided and/or vehicle supported. Rides for all levels in one of the most beautiful parts of New Zealand. 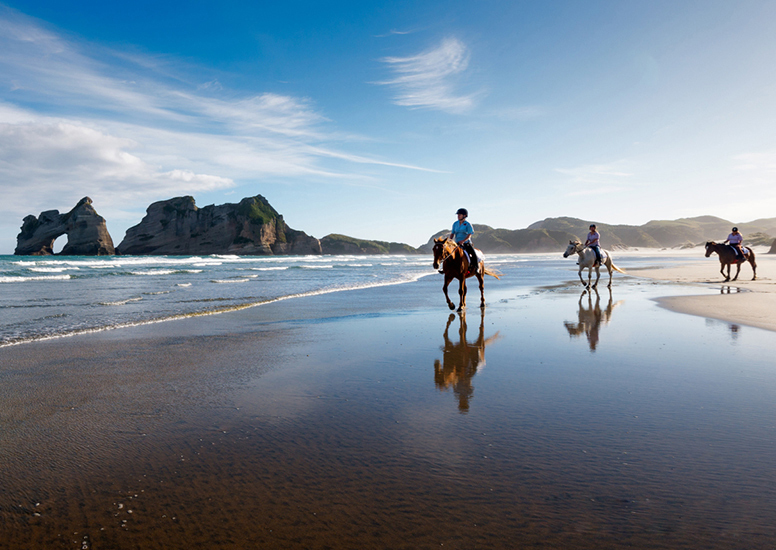 It’s the most scenic horse riding experience that will leave you speechless! For all abilities. Nelson's Neudorf Vineyard is an internationally well-known wine producer. For wine lovers and aficionados, we can provide the ultimate, bespoke, behind-the-scenes vineyard tour and special wine tastings.